It’s populous, it’s vibrant, and it’s epic. Behold Tokyo, a global metropolis without peer. Still on the mend from a 20-year-long nationwide economic slump, Tokyo’s current climate shows recent growth, particularly in the area of real estate. According to CBRE research, office rents are 7 percent higher than a year ago in the city, supported largely by the scarcity of prime space in Tokyo. CBRE’s Ben Duncan, president of North Asia and CEO for Japan, estimates that because of this scarcity, rents will continue to rise. Duncan’s comment comes on the heels of reports that international investments doubled last year, thanks to a cheaper yen that made real estate more appealing to foreign direct investment. Japanese investors, reaping the benefits of cheaper interest rates, are also in on the act. “For Tokyo CBD properties, they’re borrowing at less than 0.60 percent, and those are floating rates that are incredibly cheap,” said Duncan. “Foreign investors may be paying interest rates nearer to 1.0 percent, placing them at a disadvantage,” he adds. In the meantime, rents will continue to rise—CBRE’s Asia Pacific Market Outlook 2015 projects growth of 10 percent on the back of strong leasing demand. Since borrowing rates remain low for the Japanese, Duncan expects to see the majority of investments coming from Japanese companies. With money flowing into Tokyo from overseas investors and circulating on the ground, there’s little cause for concern about a cooling off period in the short term. But it’s the medium term (think five to eight years) that may leave foreign investors feeling uneasy. “There have been a lot of groups that have come in a shorter period of time where they haven’t really understood the market and have been unsuccessful,” said Duncan. Despite recent growth and future prospects, don’t expect Tokyo’s skyline to change dramatically anytime soon. A solid understanding of Tokyo’s market practices—different from Western practices in more ways than one—is another key to succeeding in Japan. For example, in Tokyo, the typical leasing contract lasts for a period of two years. To the Japanese, this shorter lease term accommodates price flexibility. But to foreign investors, the short term creates uncertainty over financial security and prolonged ROI stability. The questions over security and stability lead into a bigger-picture discussion about vacancy rates, which are typically low in Tokyo, currently around five percent, given the recent high demand for space. With future developments in Japan creating strong pre-leasing activity not just in core locations, but also in the secondary areas where occupiers who cannot afford the high rent districts will lease, what does this mean for the long term? “If you’re staying in Tokyo and you look out your hotel window, you’ll see just a few nice looking new developments and in between, a lot of very small, inadequate office stock,” said Duncan. Mori Building Co.’s Roppongi Hills, completed in 2003, is now the home of Google in Tokyo. Mori Building Co.’s Roppongi Hills, for example, shows how difficult it can be to accumulate land. 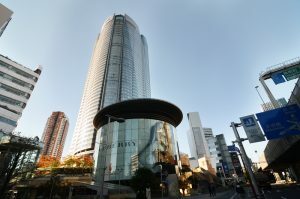 The Roppongi Hills complex, one of the largest developments in Tokyo, took 17 years to complete—and now counts Google as a tenant (the company is taking up space once occupied by Lehman Brothers Holdings).